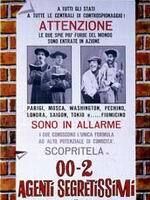 Italian comedians Franco (Franco Franchi) and Ciccio (Ciccio Ingrassia) are two simple-minded guys whom are mistaken, by KGB spies, to be government agents from their government and other foreign governments. Featuring plenty of gadgets and gorgeous ladies. With Ingrid Schoeller and Carla Cal�. (In Italian language). This film comes from a widescreen import print.